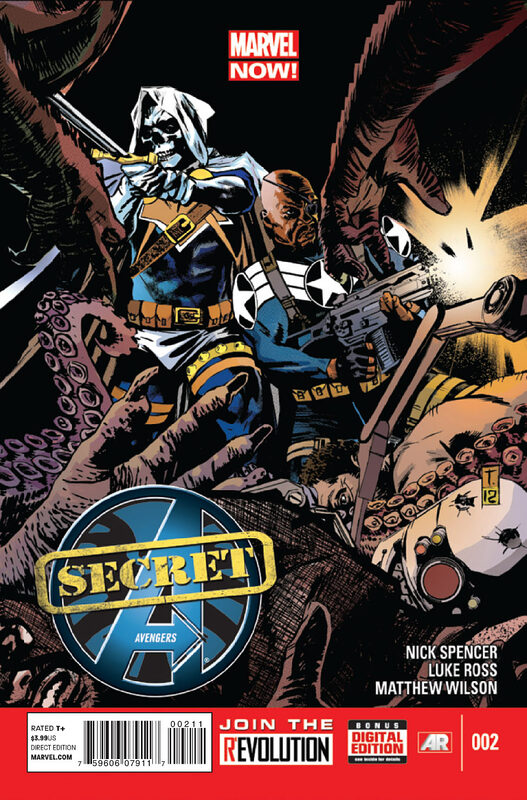 Nick Fury knows who he wants for the new Secret Avengers–the deadly mercenary known as Taskmaster! Trouble is, how to extract S.H.I.E.L.D.’s newest prospective agent from the only prison cell in Bagalia – the nation-state built by and for super villains! In Bagalia a nation created and run by supervillains Nick Fry Jr. recruits taskmaster. The villains however attack him as he tries to escape with Taskmaster and a battle erupts. Taskmaster is apparently left behind and Nick leaves. 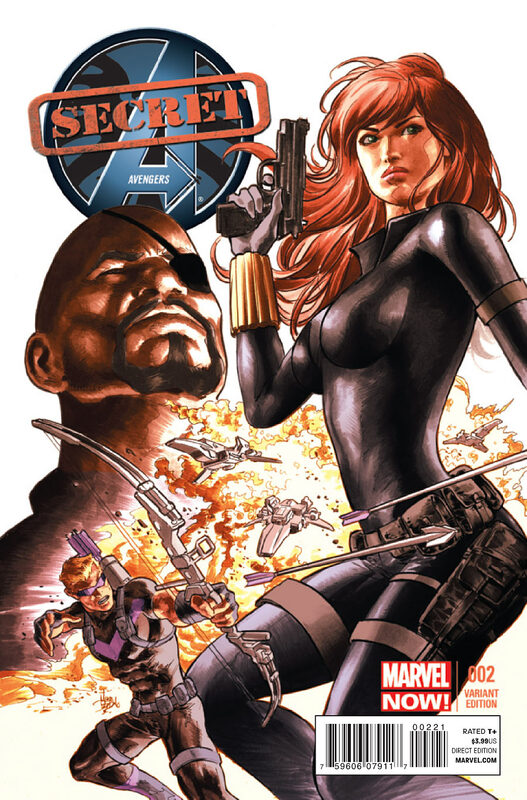 A villain pulls taskmaster aside, turns out its mockingbird and she takes Taskmaster to S.H.I.E.L.D head quarters where he is made a member of their covert team. Elsewhere the new head of AIM gains knowledge from a machine and kills his crew while rescuing Yelena Belova/Black Widow/The Adaptoid and going to Bagalia. Espionage- The covert vibe runs through every page of this issue giving it a different vine than the other books under the Avengers banner. Gadgets- The only times I became excited throughout the entire issue was when Nick Fury Jr. activated his way too cool shoe laser, which looks like it was made for James Bond and when Mockingbird used the an image inducer to save and capture Taskmaster. Flashbacks- I don’t know about anybody else who read this issue but I was downright confused upon hitting the last page and realizing that some parts of the issue were flashbacks and some were actually taking place in the present day. Silly- So as Nick Fury is escaping with Taskmaster he’s attacked by a deluge of supervillains, lame and powerful…..and he holds them off with a simple gun? Seriously? I’m supposed to buy that $hit? That’s seems pretty dumb just typing it, how did they approve that in the script? Mind Control- I literally think the premise of a mindwipe “switch/phrase” literally gives the writer a “do anything and get away with it” card that when over used may make this book pretty boring or predictable in the future. Characterization- This issue focused on Taskmaster as a major component of just about everything. Unfortunately Taskmaster behaved more like Deadpool than himself……I could not get past that. Also he’s pretty good friends with Constrictor one of the villains who attacked him in this issue……I feel almost like I’m in an alternate world here???? Inconsistency- The art was worst than Fearless defenders this month simply because it was so uneven and looked rushed. I’m sorry but I can’t pay top dollar for a book that looks this sloppy and disjointed. Sort this out or I may have to get my espionage kicks elsewhere. ← Bishop Rumored to be in X-men Day’s of Future Past! I can’t seem to get past black nick fury junior. He don’t look mixed to me. He looks as old as his white daddy. Who’s idea was he? Why repackage white HEROS as black ? Sorry I can’t get wit the banana in the ol’ banana in the tail pipe. Hey I know what would be a good idea, lets remake a buch of our HEROS over but we make them ethnic !